The picture is worth a thousand words! The Lyric Theatre in downtown Blacksburg has been in its current location since 1930. 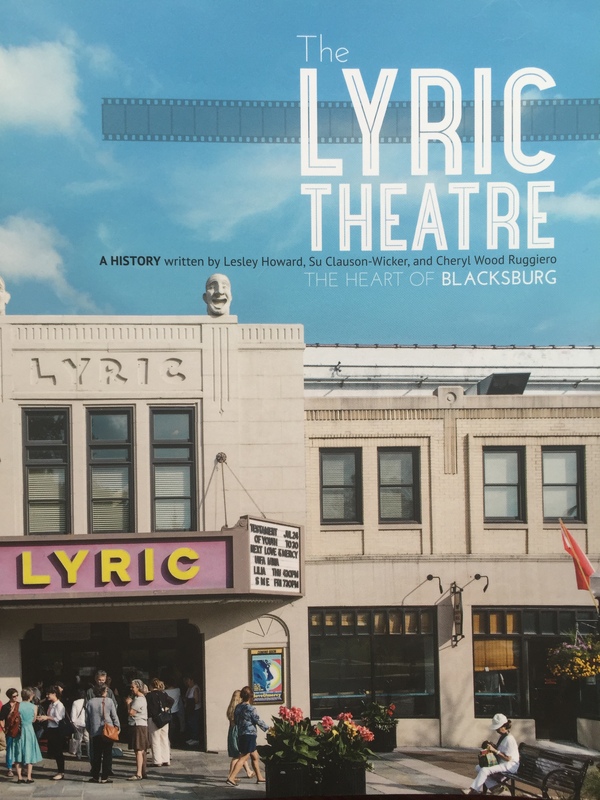 Its story is now available in a book that I helped write, The Lyric Theatre: the Heart of Blacksburg. It’s beautiful to look at and lovely to hold because the designer, Christina O’Connor, is crazy good at what she does. It’s interesting because Su Clauson-Wicker and Cheryl Wood Ruggiero are terrific interviewers and researchers and writers and copy-editors. And folks have said it reads well because I did much of the writing. This is thrilling! That said, I had an interesting conversation with a friend yesterday who asked me: are you comfortable receiving praise for this book? My answer: it’s complicated. I love it when people love something I’ve written. But I often feel like the story has come to me; it’s not “mine” — it’s ours. I wrote it down. The story is mine only insofar as I am responsible for listening closely to what I hear and discerning the story. I am responsible for paying attention, for discipline and diligence, for re-writing for clarity and power, and for finding a home for stories. But once I’m done writing, it’s not mine. It’s ours. I happen to be the writer. It also happens that this book was a pleasure to serve as a writer. Enjoy it! The story it tells belongs to all of us. And may you have the chance to listen for, and share, your stories as well. If you’d like to buy a copy of the book, you can do so at the YMCA Craft Fair November 13-15 (I’ll be there some of the time if you want a personalized copy!). It’s also available in downtown Blacksburg at the Alexander Black House, the Artful Lawyer Gallery, the Lyric Theatre, the Montgomery Museum, and Uncommonly Gifted. This entry was posted in Essays and tagged Blacksburg Virginia, Cheryl Wood Ruggiero, Lyric Theatre, praise, story, Su Clauson-Wicker, the Alexander Black House, The Artful Lawyer Gallery, the Montgomery Museum, Uncommonly Gifted, writing. Bookmark the permalink. Fabulous, Leslie! Good on ya. And you should be thrilled. It’s a big deal.